The legislative fight over the budget is now underway at the Capitol. The state’s Building Commission failed to pass any recommendations about projects that are included in Governor Evers’ proposed capital budget. The commission’s votes all came on party lines, which ended up in ties with no clear decision. Republicans are concerned over the roughly two point five billion dollars worth of bonding in the budget. Assembly Speaker Robin Vos and Senate Majority Leader Scott Fitzgerald admit that many of the projects in the budget are needed, but that the price tag is too much for one budget cycle. They say that they’d like to vet all of the plans in the Joint Finance Committee. “A lot of the items the governor ticked off I think were kind of the greatest hits of the Democrat Party,” said Senate Majority Leader Scott Fitzgerald. In his budget address Thursday night, Evers called for bipartisan efforts to address the needs of Wisconsin residents. That’s being greeted by some skepticism by state Representative John Nygren. 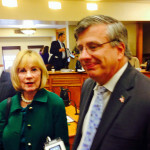 “While he talks a good game on working together, there has been no effort with any of the leaders from the Assembly or the Senate, from Governor Evers standpoint to say ‘okay where can we agree,”” Nygren said on WISN Friday morning. The Marinette Republican co-chairs the budget committee with Senator Darling. Wisconsin Policy Forum Research Director Jason Stein said Evers is proposing tax increases — but also tax cuts. “The governor is proposing tax cuts for low and middle-income earners, and tax increases on upper income earners,” Stein said. Governor Tony Evers answered the gas tax question on Thursday night. In his state budget address, the governor touched on a number of issues he’d already previewed, including K-12 schools funding and Medicaid expansion. But he wrapped up with transportation. 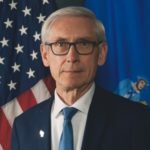 Evers said the increase – eight cents a gallon – will be offset by eliminating the state’s “minimum markup” on gasoline. He said that means motorists would actually pay less at the pump than they do now. Evers said his proposals will raise over $600 million in new revenues, and increase funding for local governments to repair their streets and roads. Bender called Evers’ proposals a “political statement.” The proposals, which Evers will include in the state budget he’ll introduce this week, are already opposed by Republican legislative leaders. Thompson, whose appointment must be approved by the full Senate, said another $360 to $400 million is needed every two years, just to maintain current conditions. And tolling is not an immediate solution. “We are somewhat limited in our ability to fix what I think is a ‘today’ problem with our system, through tolling,” Thompson said. Governor Evers is expected to act on recommendations put forward by a task force he’s appointed which includes Thompson. A new study says Medicaid expansion will cost Wisconsin taxpayers $600 million per year. 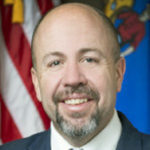 The findings by the Wisconsin Institute for Law and Liberty and UW Economist Noah Williams are welcomed by Republican lawmakers like state Senator Duey Stroebel. “Ultimately what it does to, is it moves more and more people to government insurance, and that . . . could ultimately end up as single payer, and then that becomes socialized medicine,” Stroebel said Tuesday. 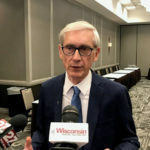 Democratic Governor Tony Evers said he thinks Republican lawmakers’ opposition to accepting the federal Medicaid expansion is based on anti-federal government feelings and and opposition to the Affordable Care Act. Evers plans to do that in his upcoming budget proposal. Wisconsin is one of more than a dozen states that have not taken federal funding to expand Medicaid to people who make up to 133 percent of the poverty level. According to the Legislative Fiscal Bureau, doing so would have saved the state more than one billion dollars from 2014 through 2019. The governor and proponents of Medicaid expansion have claimed it could make Medicaid available to more than 75,000 low-income residents while saving the state hundreds of millions of dollars.